This is day 11 of Soulful Simplicity, a 31-day series through the month of October. The first week of the series can be found here. I hope you are enriched by this series. If you have any questions or would otherwise like to connect, feel free to send me a note: lightandloveliness [at] gmail [dot] com. I remember when my firstborn was nearing preschool age. I was an early-twenties young mom living in a fast-paced city full of successful career-oriented women who delayed having children, most until their forties. 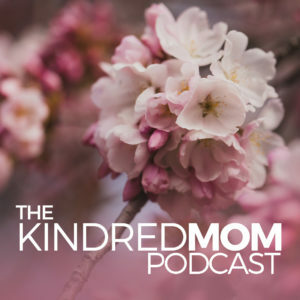 I only mention the age difference because it was a significant aspect of the self-doubt I wrestled with for a few years as I tried to make sense of adulthood, motherhood, and all the decisions that are to be made in those arenas. I saw these women—established, confident, and eager to ensure their children would be successful in the future—sign their kids up for every activity under the sun at age 3. Preschool, music classes, sports teams, museum workshops, swim lessons, acting classes, language tutoring—you name it, and I could tell you about someone in my sphere who had their kid in it. Many of them had these activities stacked back to back in the same day or daily throughout the week, meaning they were constantly going from one thing to the next without any space for anything else. I am not saying any of these things are bad. All of the above experiences can be wonderful for children, and they absolutely have their place, but I spent a stretch there feeling like I was messing up my child’s entire future because I didn’t have her enrolled in five different things at the same time. It took me a few years to develop my own sense of what makes a childhood wonderful. In time, I have come to realize that there are a number of things that weigh heavily on moms that lead them to stuff their schedules full for all the wrong reasons. I am obligated to do what others expect of me. My child must be entertained at all times. All moms are spread thin, there is no way around it. My child will not be deprived of anything if I sign them up for enough activities. I can outrun the loneliness of motherhood if I keep myself busy enough. If I take advantage of every opportunity, my child will succeed in life. I don’t love being busy, but I don’t have any other choice. I could keep going, but I will stop there, and counter every one of those statements with a different idea. Not everything that is calling out for your attention is worthy of it. Some things are not important. You can decide which things those are. You are not obligated to meet the expectations of others. Healthy boundaries are important, and must be set often and with confidence. Your child doesn’t need to be entertained at all times. In fact, you might find that their imagination and creativity come alive when they are not being entertained. All moms have the propensity to be spread thin, but there are some who make hard decisions that place healthy limits in different areas for the benefit of everyone in the family. Not all moms live spread thin indefinitely. Children who are chronically over-scheduled can be just as deprived as any other child…they can be deprived of rest, deprived of space to explore and create and imagine, deprived of opportunities for resourcefulness and self-regulation…and the list goes on. Every day has time enough to do the most important things, and anything that isn’t completed on one day can be tackled the next. Loneliness is real, especially in motherhood, but it is not fazed by a busy schedule. Loneliness can only be cured by real connection, which can be difficult to forge if one is too over-scheduled to make room for quality time with a spouse, friend, or mentor. You have no way to guarantee your child’s success in life. Yes, you can expose them to information, help them build skills, and give the experiences that shape who they become, but what if their success actually hinges on the innovative spirit they cultivate while spending hours a day outdoors? Or on the emotional intelligence they develop by creating a strong bond with family members? Some things that a child needs to succeed can’t be taught in a classroom. And last but not least: You have a choice. There may be some things outside of your control. There may be limitations and challenges. There may be sacrifices, but you hold an incredible amount of decision-making power, and you can choose parameters for your schedule that fit your family’s needs, and allow you flexibility to make adjustments for everyone’s benefit. 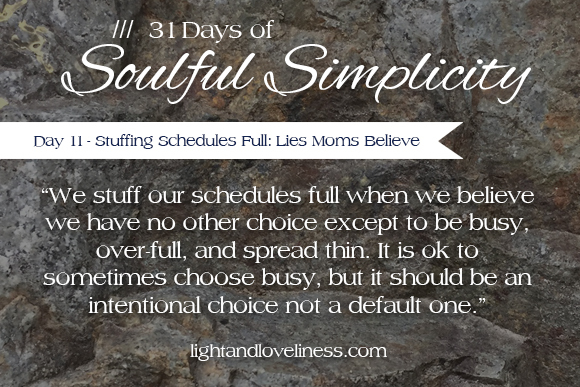 We stuff our schedules full when we believe we have no other choice except to be busy, over-full, and spread thin. It is ok to sometimes choose busy, but it should be an intentional choice not a default one.